Wendy and I have been camping on and off for almost 36 years. Our first adventure was in a tent – summer camping – but not an experience that either of us really adored. Then we borrowed a small motorhome – that was good but we spent too much on fuel just getting there. 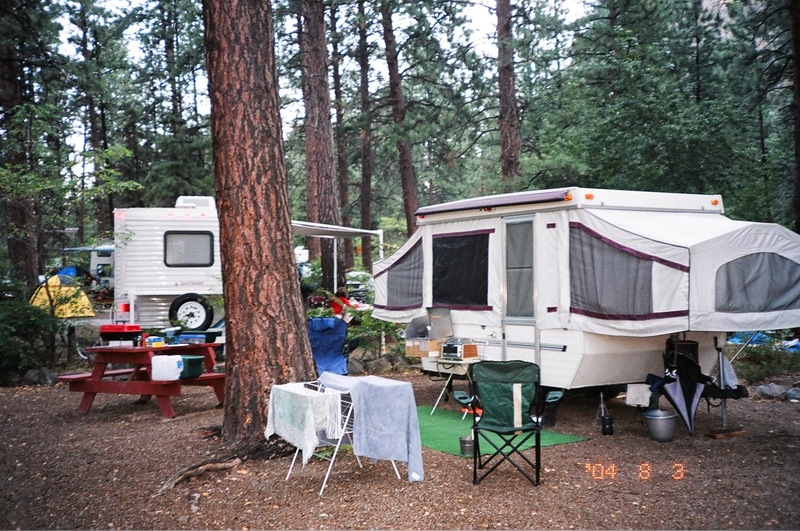 Then we rented someone’s trailer – that was better but it was old and we were novices. Finally to our own tent trailer and we were super thrilled with what we had though it was a pretty primitive trailer (compared to some). Seven years of being in the tent trailer and we moved up to our hybrid – a travel trailer but with tent ends. We’ve had this since 2005 – twelve years now and we really love it. We feel privileged and though I know at some point this too will need to be left behind I’m not anxious to give it up! My sisters are high-end hotel users…too bad for them I think. The summer is rapidly coming to the end. In the next couple of weeks, I will be winterizing the trailer and we’ll be putting it away for the winter. However, with that end of season stuff comes the joy of knowing we’ll be back next summer. This is not actually meant to be a blog post that is simply reflecting upon the past as much as it is a look back at how we as a family got into camping. It is true Wendy and I tried going out in a tent – once – and you’ll note by our camping trend that wasn’t quite what we were looking for. I love the outdoors and like eating outside, being outside, even watching a big storm while out camping. But tenting wasn’t for us. Then we planned to take a vacation in the USA. But as we were getting ready to go, Wendy fell ill and it turned out that she need her gall bladder out. Because you can’t go to the gall bladder removal centre at the mall and just get it done, we found ourselves with a week and not too many options. So we contacted a relative you owned this small C class motorhome and asked if we could borrow it. Filling up the tank with fuel was about a week’s pay so we didn’t go too f ar from home. 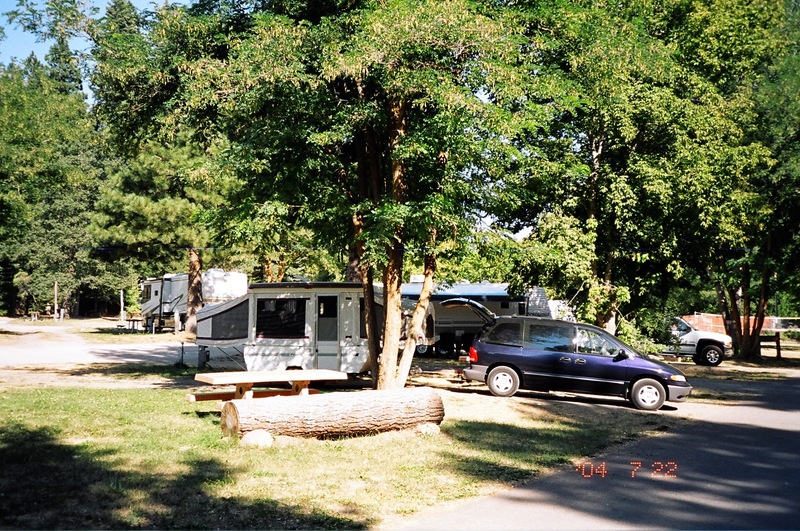 We headed to a wonderful campground near Barrie Ontario where these photos are from and while Wendy lived on soup and crackers we had a wonderful time camping with the RV. Because we had little extra cash and for a while, we ran a children’s camp we didn’t pick up our first trailer for a while. But this week did convince us that we would enjoy being a family out camping. And I have to say, some of my favourite photos are from that week. Here’s just a couple. Just a box and two beds – but we had a roof! Before the trailer we have now we had a small tent trailer – nothing fancy – in fact no fridge, furnace or hot water heater…therefore no shower or toilet in it either. Two beds – table to eat at and a small counter area. Most of what we did therefore was outside. I was going through some photos lately and I came across a couple that really illustrated how basic was our set up! You’ll see the oven is a toaster oven on a tv tray. The stove attached to the side of the trailer and we did all our cooking off of it. We had to boil all our water – even for doing the dishes. We towed with our 1998 Dodge Caravan – just a 3L engine with a 3 speed transmission. But it didn’t cost much and we had a good time covering much of the eastern coast and then in these days the west coast.